Our kids treated us to a long weekend in Disneyworld! They were traveling to Florida for a friend’s wedding and decided to take their 18-month-old to meet her favorites, Mickey and Minnie Mouse. 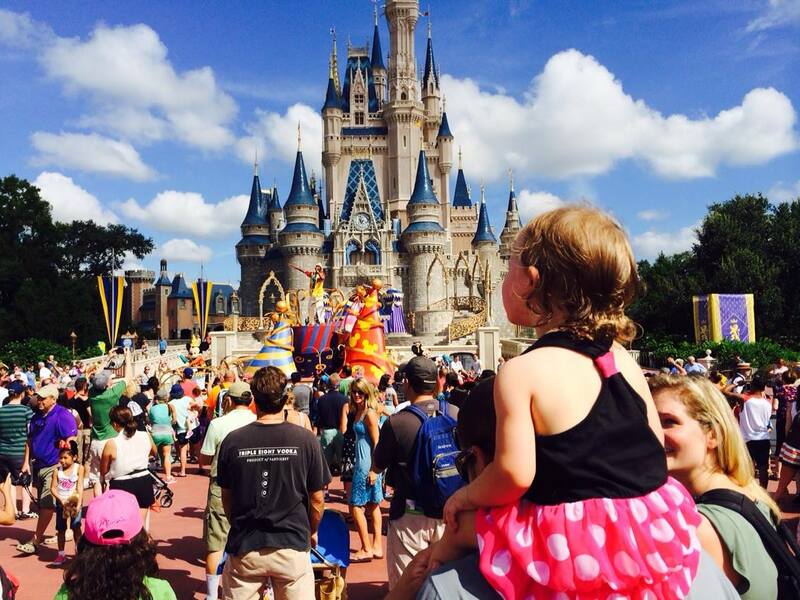 We haven’t visited theme parks since our children were little but were drawn to this trip to experience the wonder of Disney magic in a little one’s eyes. Toddlers (and grandparents!) can get overwhelmed and cranky with too much excitement so we decided to stay off-site where we’d have space to relax, cook familiar meals, and just chill. We chose a suite at the Sheraton Vistana, with two bedrooms and baths, a full kitchen, living room and enclosed porch. The resort included 3 large pools, with the one right outside our room complete with water slides and a pirate ship. Lots of fun for all of us. We rose early and headed to the Magic Kingdom. Missy was wide-eyed with wonder at the colors and excitement and was the first to start dancing when the parade came down Main Street..
At only 18 months, most of the rides were too old for Missy. But like her cousin, she was mesmerized on the Small World ride. We were first in the boat and she stood throughout the ride, dancing and smiling the whole time! By mid-afternoon we were happy to return home to the Vistana where we made a simple supper and relaxed. 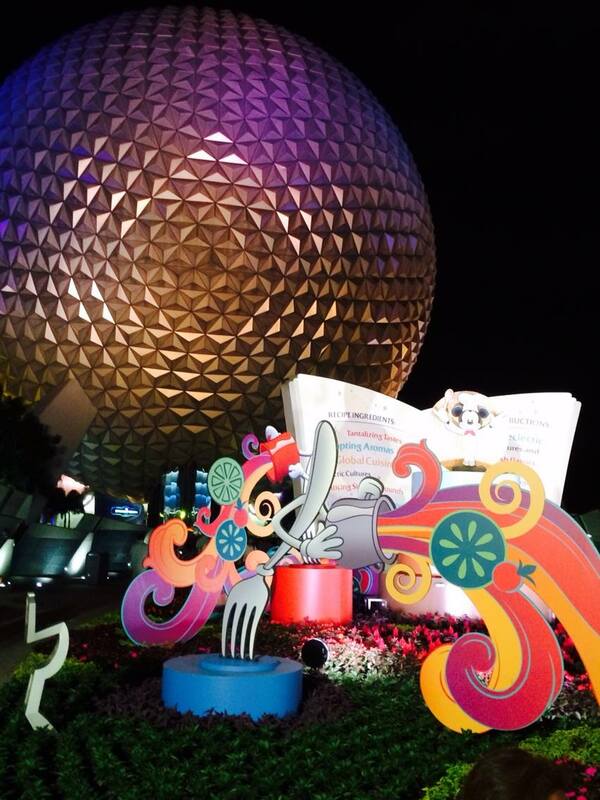 Now, I have to be honest and admit that another draw to this weekend getaway was the International Food and Wine festival in Epcot. This very popular event runs for 6 weeks in the Fall. Nearly 30 countries were represented with kiosks selling samples of food and wine (~$1 – $4) It’s an ideal event for Epcot, as the World Showcase is meant to give people a taste for different cultures. How better to do that than with actual tastes! Before getting to the event we stopped at a Character Spot to let May get a photo op with the Disney gang. She was so excited to see Mickey Mouse that she literally clawed at the ground trying to get to Mickey while waiting her turn. But when given the go-ahead, she dashed half way up to Mickey and froze. More than a little overwhelmed by how BIG Mickey was! Then on to the festival. My son-in-law put it best when he said that the Magic Kingdom was for May and the day in Epcot for us. We circled the lake, sampling wine, saki, and lots of delicious treats. We’d made a reservation for dinner at the Biergarten but in retrospect, we should have cancelled. We were all too full to appreciate the rich German food. On the last day of our weekend visit, we headed to Typhoon Lagoon. The adults all enjoyed the giant wave pool and water slides. The little one splashed in the fountains. A laid back day to end a busy weekend. Grandparent Advice: Get off the Disney property. The commute time (~20 minutes) was well worth it when we had a place to relax and make our own food at the end of a hectic day. Posted on October 21, 2013 April 2, 2019 by TravelingTullsPosted in Disneyworld, Florida, Older Adventurers, Travel with grandchildrenTagged Disney, Disneyworld, family travel, grandchildren, travel with children.